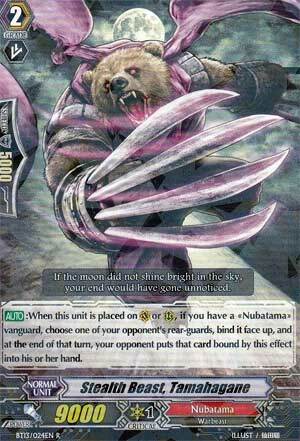 Card Effect(s) [AUTO]:When this unit is placed on (VC) or (RC), if you have a «Nubatama» vanguard, choose one of your opponent's rear-guards, bind it face up, and at the end of that turn, your opponent puts that card bound by this effect into his or her hand. Last card of the week is Tamahagane. When played, you bind an opponent's rear-guard, but it bounces to the hand at the end of the turn. Obviously he's no good by himself early in the game. There's only two ways to use him: murder what he binds permanently with your starter Kuroko, or push Late Game in the same capacity as Narukami's Desert Gunners by removing an interceptor for the push. If you go for the first option I'd try and bind annoying boosters, particularly starters, or knock out 5k in the form of an interceptor early. Boy, that's short. See you guys next week.